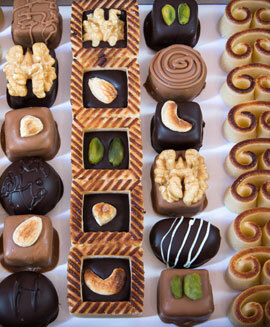 Although the origins of marzipan aren’t certain, if you ask Ralf Bentlin, the best marzipan can be found in a little shop in West Berlin. 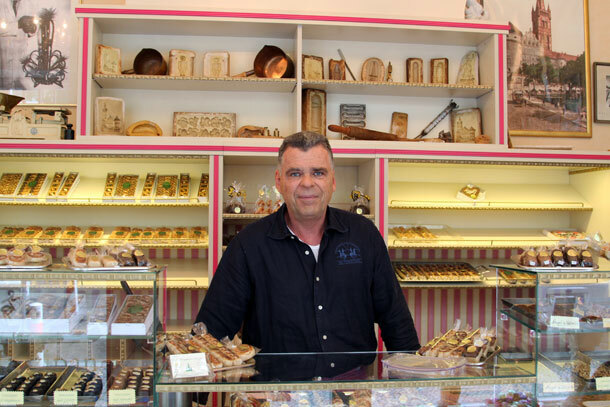 And although the fact that Ralf is the shop’s proprietor may call to question his ability to pass judgment in this arena, Ralf’s eaten his way through the research. 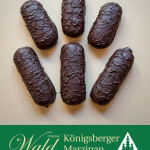 Every year he orders marzipan from all over the world—Lubeck, Spain, Toledo, Cypress, Iran—and asks his most loyal customers to blind taste the challengers against his own. His always wins. 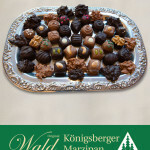 What makes the marzipan from his shop, so special? 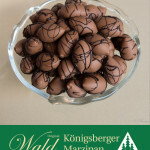 Ralf starts with the best quality almonds, adding just a small amount of sugar and some rose water. The rest of the process is a family secret that has been passed down three generations from the great grandfather of Ralf’s wife. After making his paste, Ralf sticks to the traditional way of doing things, and scoffs at the idea of using the bright colors or flavor additives that many modern producers favor. 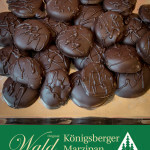 A special touch for his marzipan is the dark colored tops, made by a quick touch of a hot flame, which gives his confections an ever so slight roasted flavor. The store, on a tiny street in Charlottenburg, calls to mind the generation who started it—Paul Wald, a Prussian immigrant to Berlin, opened the shop with his wife in 1947, and the wallpaper and glass and gold display cases look as though they haven’t changed much since. 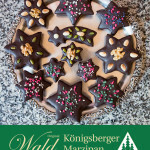 The shop, which is the only in Berlin to specialize exclusively in marzipan, is popular with both locals and tourists looking for an authentic German treat. 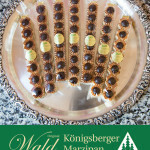 For globetrotters, Wald Konigsberger Marzipan is also available at the shop Schokoladchen in Westfalen and at the Frankfurt Airport. 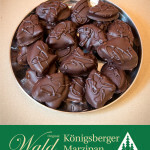 Although the marzipan recipe is kept under lock and key—the almond paste is actually made at a secret location, and only known by family members—Ralf agreed to give us a demonstration of the finishing steps, rolling and shaping the marzipan paste into Teekonfekt, a candy the 17th century European royalty enjoyed with their tea. 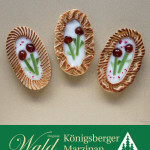 Take a look at the slideshow above to see how this master craftsman shapes his marzipan into these fancy shapes.